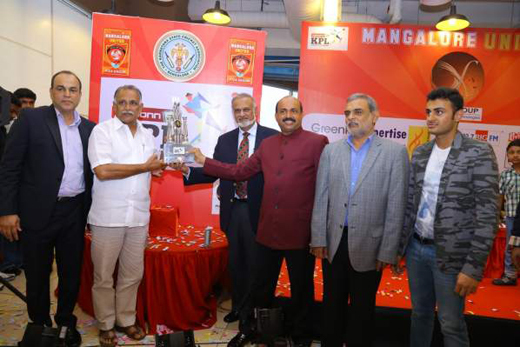 Mangaluru: August 30, 2015: The Forum Fiza mall in Mangalore wore a festive look as the Karnataka State Cricket Association and Mangalore United Team unveiled the Karbonn Smart KPL 2015 Trophy and launched the team jersey on Sunday. Minister for Youth, Sports and Fisheries Abhay Chandra Jain unveiled the glittering Trophy and wished the Mangalore United team the very best in making efforts to regain the Cup once again. Present at the event was Hon Secretary, KSCA, Mr. Brijesh Patel along with the team owners, Hon. Asst. Secy, Santosh Menon and team members. Addressing the gathering, Brijesh Patel, said, "The KPL was started in 2009 as our late President Sri Srikantadatta Narasimharaja Wadiyar felt we should create a platform to promote talent. The tournament is a platform for untapped talent from the districts. 50% of our State Senior team is from the districts." The former India star added, "KPL has become a success thanks to a very good team of ours, Udaya Tv came forward to air live the matches and now we have Sony Six doing it. Last year we had a viewership of 25.2 million." "Three years were lost when we were not at office and we were keen to revive the KPL when we came back. We have won the Ranji, Irani and Vijay Hazare titles back-to-back and we now have so much talent. What these boys required was a platform to perform and this is what we are making efforts to give through KPL. "We are seeking to make available the required facilities and infrastructure to the district boys. Travelling and staying away from home affects the performance of most players. It is our endeavour to ensure that the boys develop in their own environment and we are planning this on a one-by-one effort." Talking of the Mangalore United team, he said, "Mangalore United has a team of dedicated players in it. I would like to see the players give it their best and perform well, which will help them do well in the forthcoming T20 WC. I wish them luck," he said. The team retained star player, Karun Nair, who was chosen for the Sri Lanka tour after a fourth innings century against South Africa ’A’ in a four-day contest for India ’A’. He hammered a superb triple ton in the Ranji final against Chennai to help Karnataka retain the National Crown. He became only the second Karnataka player to get a Triple ton after opening batsman K.L Rahul had become the first earlier in the season. For their second player, Mangalore United retained speedster Ronit More and then picked offie Udit Patel, keeper-batsman Avinash KC and left-hander Sishir Bhavane. "We looked keenly into every detail before choosing the team. We are very happy with the team this year. As a team, we are working really hard to bring home the trophy this year. We organised trials in our catchment area to encourage young cricketers, and, we are hoping to have few matches in Mangalore in the coming years", said Mr. B.M. Farookh, Chairman and Managing Director, Fiza Group. "We are on the lookout for land in Mangalore, where an amazing KSCA stadium can be built to help all aspiring cricketers in the coastal City. Mangalore, which has good transportation facilities, offers a good opportunity for Dakshina Kannada, Uttara Kannada, Udupi and Kodagu catchment area players," said Mr. Mohiuddin Bava, sitting MLA of Mangalore North Constituency and the Co-owner of Mangalore United. Mangalore United tasted success in the second edition of KKPL and they are craving for that feeling again. Mangalore United have the best opportunity to clinch the crown if the players in their ranks play to their respective potential. Team: Karun Nair, Ronit More, Shishir Bavane, Udit Patel, Avinash K C, Syed Moinuddin, Pradeep T, Bharath B.N/ N.P, Rohit Sabharwal, Rohan Kadam, Mithrakanth Yadav, Nihalf Shilar, Arshdeep Singh Brar, Nishcith Raj.